What were you doing prior to entering the seminary? I was a high school student at Paul VI. What influenced your decision to enter the seminary? I knew it was time to enter when to the best of my ability, I realized that the priesthood was what God has called me to and that it would give me the joy and contentment I had been lacking, that I had been searching for. Through the guidance of Fr. Romano, through spiritual direction, and of course prayer, I decided my senior year of high school to enter the seminary. What are the highlights of the seminary? The highlights of the seminary are numerous; praying and going to Holy Mass together every day in community is a true blessing. We also share meals, attend class, play intramural sports, hang out, watch movies, and develop lasting friendships. Living with 30+ young men from various cultural backgrounds on fire for the Lord hoping to serve the Church one day as priests is a great blessing! 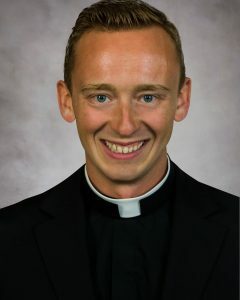 Advice to other young men considering the priesthood: Do not be afraid to be called by God to serve as a priest! Deciding to enter the seminary was the greatest choice I have ever made; I am so happy and blessed to be preparing to serve our Church as a priest. If God has called you, I hope and pray you can say “yes” to him and live out your vocation: you will be supported every step of the way!